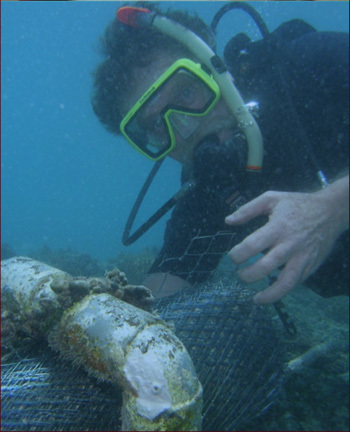 Koster is studying coral reef restoration technologies. John Koster, a graduate student in ocean sciences at UC Santa Cruz, was one of 11 military veterans honored by the National Science Foundation (NSF) at a ceremony on Wednesday, November 5, for veterans with NSF Graduate Research Fellowships. Koster served for 30 years in the U.S. Coast Guard and received two meritorious service medals. During an official visit to NSF headquarters in Arlington, Virginia, Koster and the other veterans participated in group discussions with program officers and agency officials on what it means to be a veteran and an NSF Graduate Research Fellow. In the afternoon, NSF held a formal ceremony highlighting veterans and their contributions to the STEM fields (science, technology, engineering, and mathematics). The ceremony was followed by a poster session where the fellows discussed their research and personal motivations in pursuing graduate school in their field of interest. Koster's poster presented his research on coral reef restoration technologies. 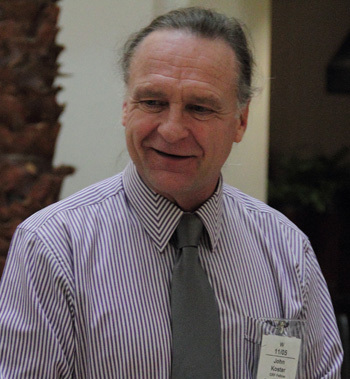 Working with Donald Potts, professor of ecology and evolutionary biology, Koster is studying a patented marine restoration technology called Biorock, which uses a weak electrical current in seawater to create reef-life structures by precipitating calcium carbonate onto metal frames. The process is reported to enhance the growth of reef-building corals and has been used in reef restoration efforts around the world, but there has been little independent testing of the process to verify its effectiveness. Koster is conducting experiments in the laboratory and in outdoor pools to measure biological responses to the process and assess its potential value for reef restoration and coral propagation. In 2015 he will begin further experiments in collaboration with researchers at the Hawaii Institute of Marine Biology.